Denmark has decided that it will not grant permission for a northern route of the Nord Stream 2 pipeline project and has asked the Russian-owned company to look into a southern route instead. It is likely to delay the completion of the controversial project. Russia’s Gazprom and the western companies involved in the project had hoped to complete the pipeline by the end of 2019. A change of the route in the Baltic Sea would entail substantial delays. The 1,225 km long pipeline, already under construction, has come under fire from the United States and a number of eastern European, Nordic and Baltic Sea countries, who fear it will increase EU reliance on Moscow. The pipeline, which will carry Russian gas straight to Germany under the Baltic Sea, has also been criticised in some quarters because it would deprive Ukraine of lucrative gas transit fees. Four countries – Finland, Sweden, Germany and Russia – have approved the pipeline’s construction. Denmark is currently the only country that has not yet issued a permit for the construction in its territorial waters. Thus, the possibility of a potential Danish refusal is on everyone’s radar. “Gazprom saw another refusal from Denmark on the Nord Stream 2 route,” the press service of Naftogaz, the national oil and gas company of Ukraine, has said in a Twitter statement. This reaction is, however, exaggerated. The southern route through the territorial waters of Denmark is subject to a law that allows Copenhagen to assess the request for the construction of Nord Stream 2 from the point of view of foreign and security policy. “When the Nord Stream 2 company provides the Danish authorities with an environmental impact assessment, it has to go through the normal procedure with public hearings etc,” the spokesman said, adding that a decision from the agency will depend on this process. Due to the multi-staged process, details regarding a possible timeline are not yet known. The news about the changed state of play comes as a backlash after a spokesman for the gas pipeline company announced on Monday (25 March) that it expected to receive approval from Danish authorities for a 180-km stretch of the pipeline under the Baltic Sea in time to finish the pipeline by the end of 2019 as planned. Nord Stream 2 spokesman Jens Mueller told Reuters there was “good reason” to believe the Danish authorities would process a second proposal submitted by the project in August 2018 within eight to 12 months, allowing the pipeline to be finished on schedule. 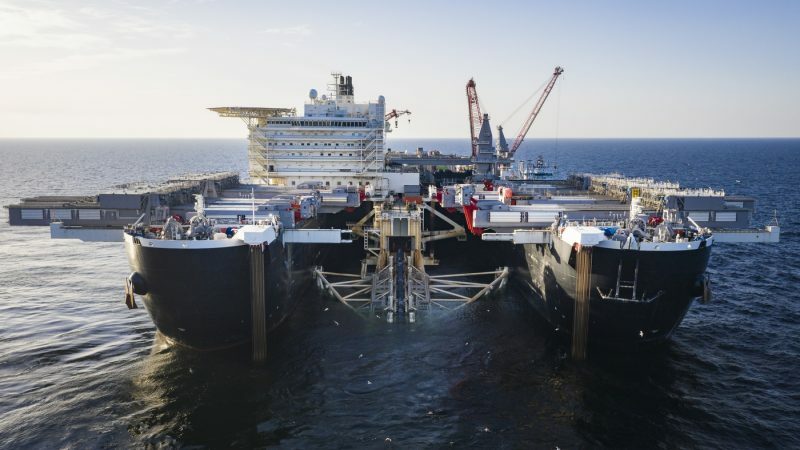 Nord Stream 2 AG, in a statement to EURACTIV, confirmed that the Danish Energy Agency has not rejected either of the two pending permit applications and that both remain valid. “Nord Stream 2 will now carefully evaluate the request from the DEA and then decide what steps should be taken next,” the statement added. “The DEA has requested Nord Stream 2 to include a route option in the Danish exclusive economic zone to the south of Bornholm into the environmental assessment,” the Nord Steam 2 company told EURACTIV. The proposed third route, referred to in the statement, would not run through the territorial waters of Denmark. Two possibilities, a third to come? A letter by the Nord Stream 2 AG president, Matthias Warnig, obtained by EURACTIV’s media partner BiznezAlert.pl, also suggests that Denmark does not agree to the Northern route in the country’s exclusive economic zone and expects Nord Stream 2 to undertake an environmental impact assessment and another (third) application for permission to build along the southern route delineated in Danish territorial waters. 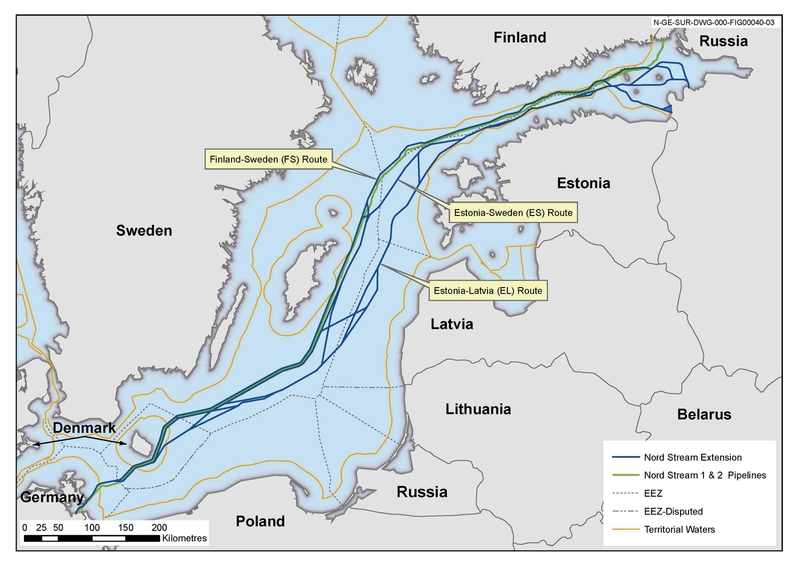 Until recently, laying a gas pipeline in the Baltic sea area between Denmark and Poland was impossible because of a nearly 40-year-old border dispute between the two countries over territorial waters around the island of Bornholm. The dispute was the result of the 1982 Treaty on the Law of the Sea, which states that each coastal country has the right to use the sea area up to 200 nautical miles from its coast. National mainlands are geographically so close that the demarcation line of the two countries’ exclusive economic zones overlapped. On February 28, the DEA announced that the ratification of the agreement ending the territorial dispute with Poland means that the Danes must receive from Nord Stream 2 a full assessment of the environmental impact of the gas pipeline project that would run through their territorial waters. The maritime area, also dubbed ‘the Polish banana’, could now be considered for an alternative route through the waters between Bornholm and Poland. Danish newspaper Politiken referred to sources in the DEA to indicate that Denmark is highly likely to ask Nord Stream 2 to submit a third application including territorial waters between Poland and Bornholm. That may mean further delay the project and increase costs, as it may take up to one year to consider it. According to this information, Denmark may postpone its consent by asking Poland for its opinion, which would again delay the construction due to Poland’s reluctance towards the whole project. Warsaw sees Nord Stream 2 as a threat to Europe’s energy security. As EURACTIV reported last year, a possible Danish veto would not directly block the project as Nord Stream 2 AG, according to the company’s own information, had a plan in place for an alternative route. The routes of Nord Stream and Nord Stream 2 are not identical. Industry sources said that the route for Nord Stream 2 in the Danish EEZ was chosen precisely because Denmark had been supportive at the time and advised it as the most appropriate route. According to Russian planning, the Nord Stream 2 was meant to become operational in late 2019 and was set to run from the Russian coast along the Baltic Sea bed to the German shore.